A snapshot of the nation's jobs picture. If you prefer your news in small bites, the most important numbers from July's employment report are these: 163,000 jobs were added last month, bringing the average number of jobs created in the past six months to 131,000. At that rate, unemployment won't drop below 6% until 2024. July's employment report, released Friday, included the collection of figures that have become uncomfortably standard in recent years. A high percentage of the jobs created last month were in temporary or low-pay positions. State and local education employment declined for the 31st time in 42 months. The employment-population ratio -- the percentage of working-age citizens with a job -- declined to one of the lowest levels in 30 years. The most complete measure of unemployment that includes those who have given up looking for work and those employed part time involuntarily ticked up to 15%, about double where it stood five years ago. We are better off than we were even a year or two ago, but it is grim. Ronald Reagan quipped that "a recession is when your neighbor loses his job. A depression is when you lose yours." With the average duration of unemployment now at almost nine months and an estimated 4 million Americans out of work for longer than a year, we may need a new name for the current mess. 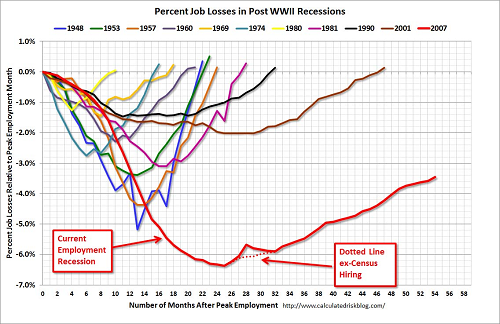 As I noted last month, it's likely that today's employment decline will exceed the Great Depression in duration. Survey after survey shows the reason businesses remain reluctant to hire is simple: Economic growth is too slow. With consumers still shedding debt piled on during last decade's bubble, it may stay that way for a while. President Barack Obama said the report showed Americans were at last "finding work." Mitt Romney, looking to add himself to the employment rolls, said it showed the opposite. The truth is we never know exactly what the nation's jobs picture is doing month to month. Now seems like a good time to explain one reason why. Employment reports are based on fairly small samples, and then tweaked in an attempt to produce a cleaner view. One of those tweaks adjusts for seasonality. Jobs numbers follow predictable swings, with employment plunging in January as retailers let go of seasonal workers and again in July as educational workers go on hiatus for the summer, with spikes in between. The Bureau of Labor Statistics adjusts around these swings to make each monthly report comparable to the last. The adjustments can be huge. More than a million jobs were actually shed last month, but seasonal adjustments bumped the figure up to the reported gain of 163,000. Nearly a million jobs were added in February, but seasonal adjustments cut the reported figure down by three quarters. These adjustments are useful, but they're anything but a perfect science, and there's a growing consensus that seasonal adjustments are more flawed than usual of late. The recession caused structural changes in how employers hire and fire, with retailers acting more cautious during the holidays, and state and local governments operating with leaner payrolls altogether. So the models used for seasonal adjustments, still largely based on pre-recession trends, may be badly outdated. What it likely means is that employment reports look artificially good early and late in the year, and artificially bad in the middle. Over the course of a year the differences even out and become irrelevant. But any one month's employment report is highly suspect -- more so than usual. What next? The Federal Reserve is widely expected to embark on another round of quantitative easing -- money printing -- next month to try and juice the economy. "A" for effort, but it's hard to see what this will accomplish. Interest rates are already astonishingly low, businesses have little willingness to expand, and consumers have no room to borrow. Meanwhile, the "fiscal cliff" -- a mix of tax hikes and federal spending cuts -- looms four months away. Unless Congress can agree on a fix, the employment picture may very well get worse before it gets better. Things change on a dime. Employment could bounce back faster and further than nearly anyone expects. A rebound in housing and the continuation of an epic surge in energy production could be the keys. But at 5 years old, the scars from this employment crisis will last generations. For millions, any rebound will be too little, too late.